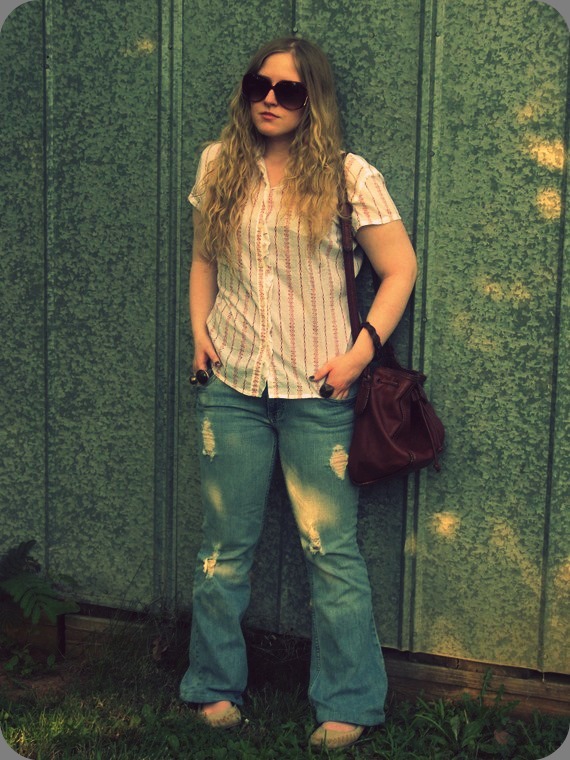 Time to show off your thrifted treasures and oufits again...so let's see what you've found! I was really excited to see all the first time participants last week, so keep spreading the word about 'Thursdays are for Thrifters' and don't forget to provide your link back! 1. Be a follower of Spunky Chateau via Google Friend Connect or Bloglovin'. 2. Submit your link below (next to that little blue frog-lookin' guy at the bottom of this post). Your links must be less than a week old at the time you post them and must include either photos of one or more thrifted finds OR an outfit post featuring at least one thrifted item. This link party will be open for one week. You may make multiple submissions. 4. Check back to see everyone's thrifted finds! I wish I had remembered to take an up close photo of the pattern on this shirt, but I forgot until just now and I don't have time to take one. Maybe for tomorrow. Mocassins: Thrifted, $5. Jeans: Arizona, $20., Vintage Shirt: Thrifted, $2.50. Vintage Bag: Thrifted, $3.50., Sunglasses: Old Navy, $4. Bracelet: Charlotte Russe, $4. Great round up of looks. retro cute, I'm always a fan of all your vintage/retro outfits. I wish I could find as many at our thrift stores. Thank you for hosting again Meagan. Thursdays are fun! Very cool post! Love the shirt! Rocking right along aren't you little chickie? I love the jeans. I remember when my son (Navy Boy) moved out and I had to defunkify his room. I found 3 cheese graters! I'm a little old for that look but I do love the hippie style! will be here next week in full swing! This is such a cool, laid-back look! That shirt looks like a great find that you'll be able to wear with so many different things. Love finds like that! love this casual look! that shirt looks great with the ripped jeans! Thanks for stopping by my blog and inviting me to your party! I'm linked up. Love the bag! Especially with that kind of a price. :) Gotta love thrift stores! thanks so much for the invite! I'm a follower and submitted my post from today! Great concept! I have a regular post I do called Thrifty Threads, I'm such a thrift junkie! Ooh! I love it. I'll try to play along next week. Thank you for the invite! I will most definitely link up :). Thanks for stopping by my blog! I'm following you now and can't wait to participate in next Thursday's thrift link up! Follow me too if you'd like! You look awesome!! I love your jeans, they fit you brilliantly. love this Thrifting Thursday business...I found so many great blogs through this! Whoops, cut the top of my head off! Not my best feature anyway. Thanks for inviting me to be a part of Thursdays are for Thrifting, Meagan! Thanks for inviting me to your link up!. i appreciate I hope that you will follow my Blog! what a great idea, I will try to participate soon! I suddenly have a strong urge to hit the nearest thrift store..